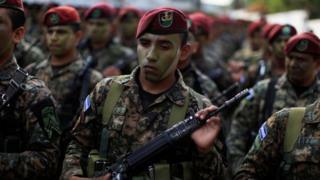 The government of El Salvador has deployed a new heavily armed unit to fight criminal gangs in rural areas. The 1000-strong special force is equipped with helicopters, armoured cars and assault weapons. Officials say it will target gang leaders who left the cities because of a government crackdown. There are an estimated 70,000 gang members in El Salvador. The country has one of the highest murder rates in the world largely due to their turf wars. At a ceremony to unveil the new force, Vice-President Oscar Ortiz said:"The moment has come to stop the scale of violence which has imposed itself in the last few years on our country and which has created so much blood and sacrifice." "We are going to go after them in the countryside and in the city," he said, adding that human rights would be respected. Image caption The unit is made up of 600 army commandos and 400 elite police officers. Image caption Members of the new unit demonstrated their training on how to capture gang members. Last month the government started a campaign against gang leaders, many whom run their operations from jail. President Salvador Sanchez Ceren, a 71-year old former left-wing guerrilla commander, declared a state of emergency at seven prisons and 299 high-ranking gang members were transferred to other prisons. He also presented a bill to Congress to isolate jailed crime bosses by limiting their movements and family visits, as well as blocking mobile phone signals from their cells. The government pressure led to an offer by the gangs for negotiations which President Sanchez Ceren refused. He has been criticised by some of his left-wing allies wary of trying to resolve gang violence with hard-line tactics.